Today was the Japan Custom Knife Makers / Japan Knife Guild Custom Knife Show. Right away you see there are problems. To my mind a custom knife is one made to my specifications. Although I could have ordered a custom knife (and one of my friends has done so a couple times in the past) what the show should actually be called is the “Japan Handcrafted Knife Show” or, perhaps more accurately, the “Brutal Walk of Expensive Temptation”. The most dangerous table was a knife maker from Fukui Prefecture. His knives were not only nice, they were solidly within the “yeah, I could totally justify that” zone. I walked the brutal walk of expensive temptation a couple times and then left to run a few errands. My first errand was a trip to Ito-ya to acquire a couple fountain pen converters that are hard to find in the USA. While I was there I discovered bottles of ink from a now defunct pen company and added those to the purchase as they have some resale value. From there I went to a bookstore to pick up one kind of ink and discovered, much to my surprise, a different kind of ink in a cool, old-style bottle. I also saw the note saying “only one bottle per greedy reseller” (something like that). Luckily, they also had some hard to find flavors in newer bottles, too and I was able to get some of those. I then got home in time to prepare the room for the girls’ return from the in-laws. I also managed, after posting a picture to a forum, to sell two bottles of ink and one of the converters. This entry was posted in Japan, Random and tagged ink on April 2, 2016 by DELively. The ink’s only been in the pen a few hours, but I can already tell this relationship isn’t going to last. Thanks to Massdrop (note: that link requires free registration; if you register and make a subsequent purchase, you help this site produce more blather) and occasional sales here and there, I’ve managed to acquire a decent supply of ink. The trouble is, with fountain pens, changing ink is a hobby by itself. With a ballpoint pens–in their various paste, gel ink, roller ball forms–changing inks involves a little twisting, a little inserting, and a little more twisting. If you don’t like an ink, you repeat the process and get something you like with little trouble. You then throw away the refill you don’t like. With fountain pens changing inks involves twisting, disassembling, rinsing, flushing, draining, soap and ammonia, soaking and a long period of drying. Then you get to load the ink and start using it. If you want to use a new ink tomorrow, you have to start preparing today. If you don’t like an ink, you have to dump it out (probably wasting what’s in the pen) and then you’re stuck with a bottle that would last a long time under normal use but seems to precious to just dump out and throw away. The more inks you have, and the more you want to try them, the more you have to go through this process. I personally haven’t gone as deeply down the ink rabbit hole as others because, luckily, I’m fairly picky about how I want my pens to work. 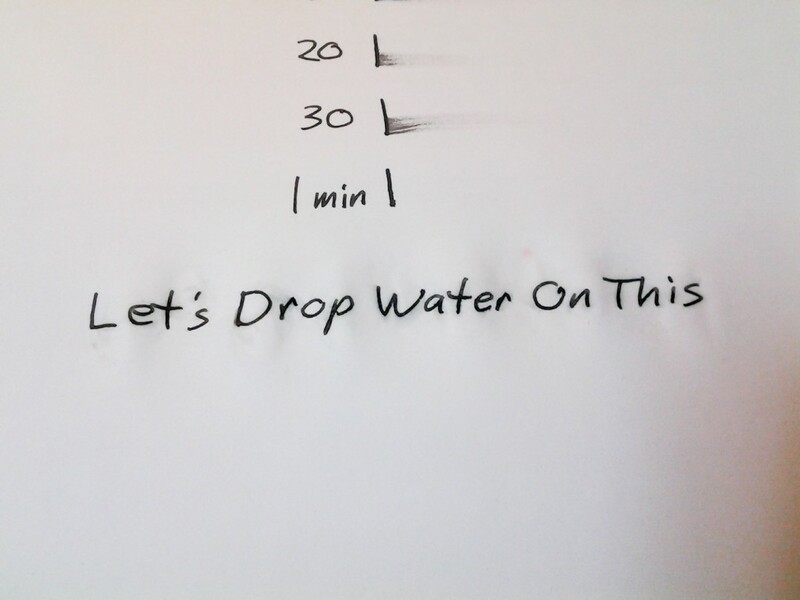 I want the ink to go down smoothly and evenly and to dry quickly. If an ink doesn’t feel right, I might try it in another pen and then abandon it. it’s a bit like when TV shows keep the same character but change actors. Yeah, everything is still the same, but something is not quite right. Today and yesterday, though, as part of a plan to use things or “loose” them, I cleaned several pens and filled them with inks I’ve acquired and have been meaning to try. I kept six of them the same because I either like the ink/pen combinations too much to mess with right now or they were recently changed or I don’t have a suitable replacement. My current pen and ink load out. Some have changed, some have not. 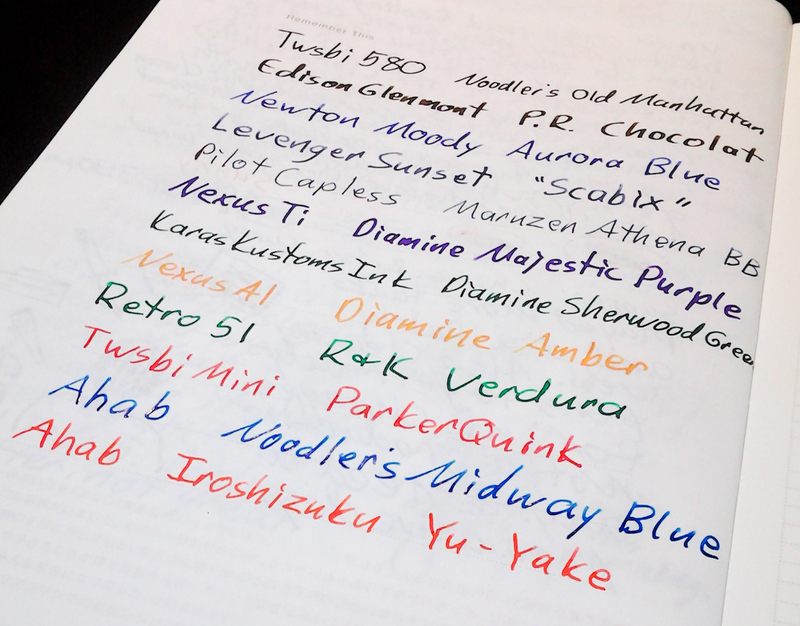 Most of the inks and pens work together well, but one pairing doesn’t seem to be working out. The Diamine Amber and the Nexus Aluminum don’t seem to be playing nicely together. The Amber looks great once it dries but it feels dry as I write. I have a feeling this relationship isn’t going to last and Amber will be moving on to someone else. The trouble is, that means I have to clean two pens, so maybe I’ll see if I can keep this couple together for a while. This entry was posted in Pens and tagged ink on February 1, 2016 by DELively. There’s something about this that’s so black, it’s like how much more black could this be? And the answer is none. None more black. –Nigel Tufnel, Spinal Tap guitarist. Although I have several kinds of ink sitting around, I’m not the kind of fountain pen user who swaps out inks constantly. Instead I like to find a perfect combination of pen and ink and then stick with it. Sometimes, though, I change pens but keep the ink. 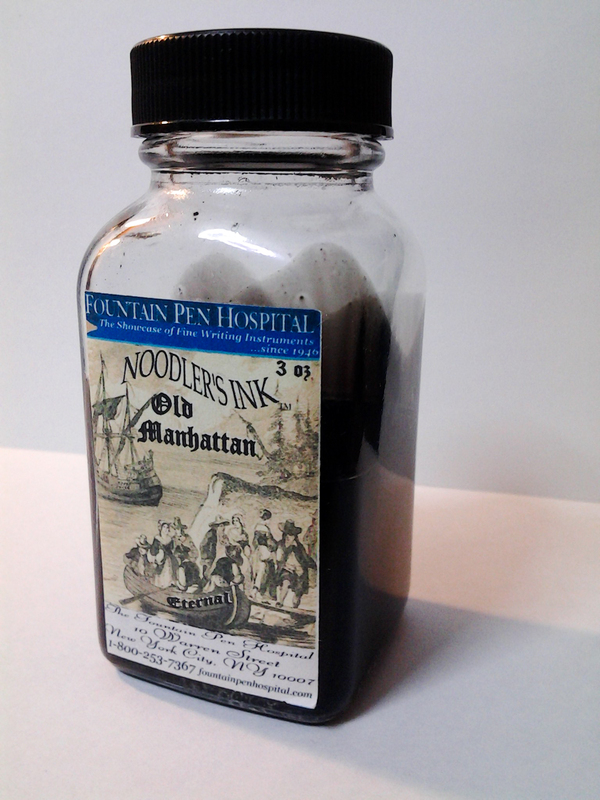 I don’t remember how I stumbled across Noodler’s Old Manhattan. I either read about it on Fountain Pen Network, or found it on the website of the New York based Fountain Pen Hospital as the ink is exclusive to them. I seem to remember it being recommended as one of the “blacker black” inks available and for some reason that made me interested in it. I put it in my Pilot Vanishing Point and it immediately became my favorite ink. 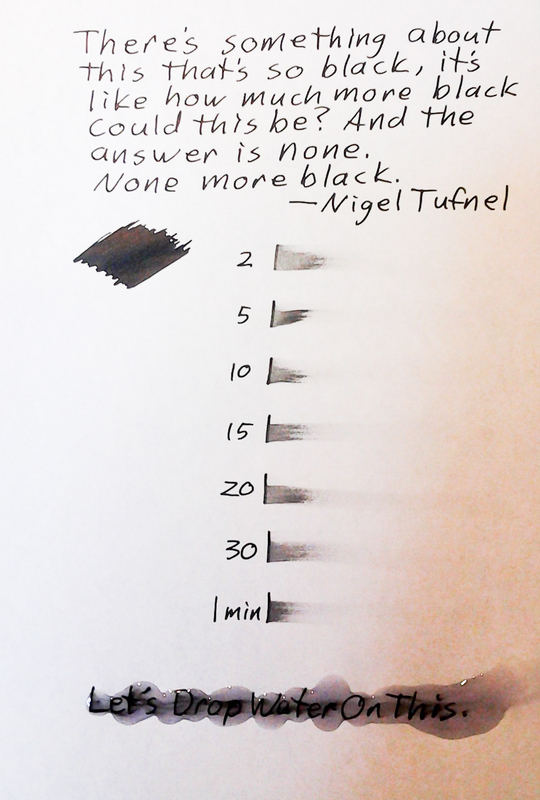 It is about as black as it can be, more black than Aurora Black, which is also one of my favorite inks. Old Manhattan is smooth and, at least on regular copy paper, dries reasonably quickly. Once it’s dry, it doesn’t smear and it doesn’t wash off if it gets wet. With other inks, Aurora included, if I’m working during a Tokyo summer and the Communists Heat Resistant Individuals who run the school where I work have set the air conditioner to “Mild Swelter”, my sweaty hands and forearms end up printed with what I was working on. Note: THAT ink never seems to wash off. What evil is this? Even when I write a heavy, wet line, it dries reasonably quickly, at least on regular copy paper. Noodler’s Old Manhattan on copy paper. Noodler’s Old Manhattan on Tomoe River in terrible lighting. It looks great; dries eventually. After it dries, it also holds up to spills rather well. The following pictures show the ink after I’ve wiped away the water (which sat on the ink for a couple minutes). 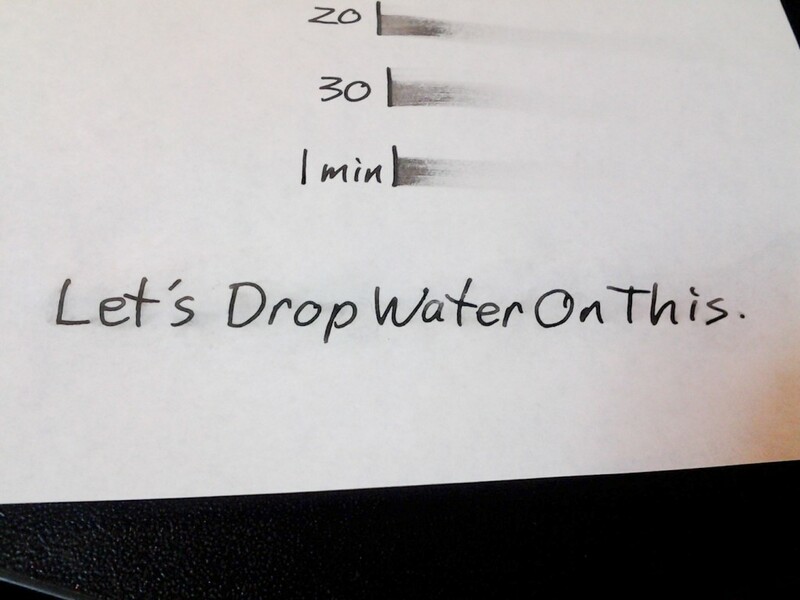 Noodler’s Old Manhattan on copy paper after the water’s been wiped away. Noodler’s Old Manhattan on Tomoe River paper after the water’s been wiped away. I’ve finished almost two bottles of the ink since I bought it and already have two replacements in storage. It is now used in my newest workhorse pen, a TWSBI 580. I like the ink capacity (note to the Pilot Pen Company: find away to increase the ink capacity in VPs and you’ll win me back). I also like that I can easily disassemble and clean the pen. That leads to the main negative of Old Manhattan: it’s got bits floating in it. 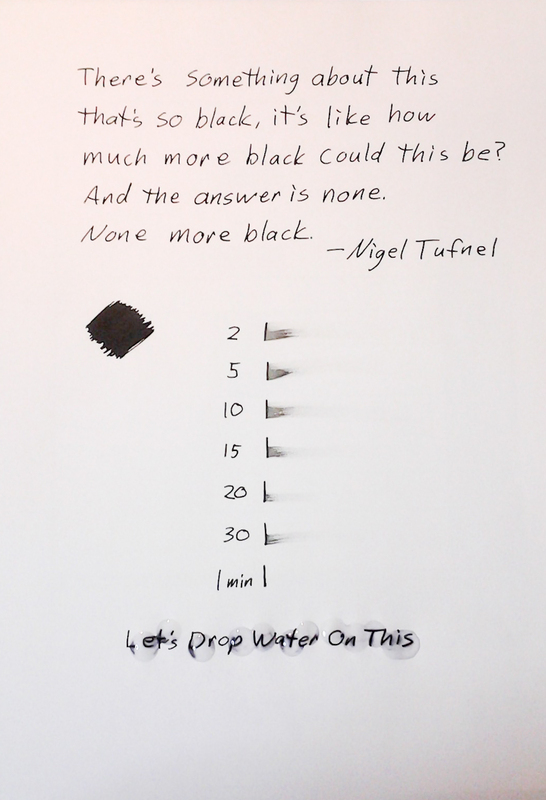 In order to make it bulletproof, it lays down black sediment that, according to Noodler’s, resists all known tools of forgers, including bleach and UV light. That sediment, though, can build up in your pen. After years of using it in my Vanishing Point, with what I thought were frequent thorough cleanings but were really only basic rinsings, I was shocked to see how much black sediment came out of nib when I soaked it with a proper cleaning solution. I never had any clogs, but I did notice that red ink (after it became my marking pen) always seemed bit darker than I expected when I used it in the pen. The half empty bottle of Old Manhattan. You can see the sediment clinging to the sides of the bottle. Fountain Pen Hospital also sells a Blue Manhattan that I may have to check out some day. First, of course, I’ll have to find the perfect pen for it. This entry was posted in Pens and tagged ink, Noodler's on January 26, 2016 by DELively.